Despite all the development taking place in all spheres of India, village tourism in India still remains a strong trend for any tourist visiting India. Many culture and heritage lovers still prefer visiting villages instead of multi faced cities of India. And that too village tourism in India is not new. 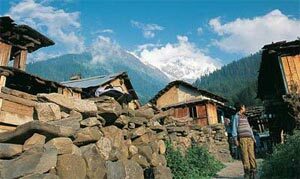 For years the growth seen in the number of tourist visits to Indian villages has been immense. Viewed from a distance, an Indian village may appear deceptively simple. A cluster of mud-plastered walls shaded by a few trees, set among a stretch of green or dun-colored fields, with a few people slowly coming or going, oxcarts creaking, cattle lowing, and birds singing--all present an image of harmonious simplicity. Once you have made up your mind to be a part of village tourism in India then please make note of some useful suggestions. Villages in India are rich on culture and traditions and the locals take immense pride in being part of it. It is advisable that you hire tour guides having exclusive knowledge about tourism in India villages. This not only makes you aware about the customs of the visited village but also helps you interact with the local people. It is hoped that you develop interest as you tour Indian villages as per a tourists interest and makes it a memorable experience. And always remember : India lives in its villages.